There are quite a few possible explanations as to why we have birthday cakes, nobody is completely sure how the tradition started. Another explanation is the birthday cake started in Germany. 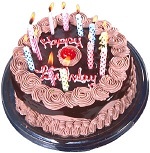 Geburtstagorten was a type of cake that is said to have been used to celebrate birthdays. - Discover The Insider Guide To Easily Master The Art Of Cake Decoration! - You Too Can Produce Cakes That Look Professionally Done But At A Fraction Of The Cost! - All written in simple language, with easy to follow step-by-step instructions, quantified recipes, clear directions and beautiful illustrations.